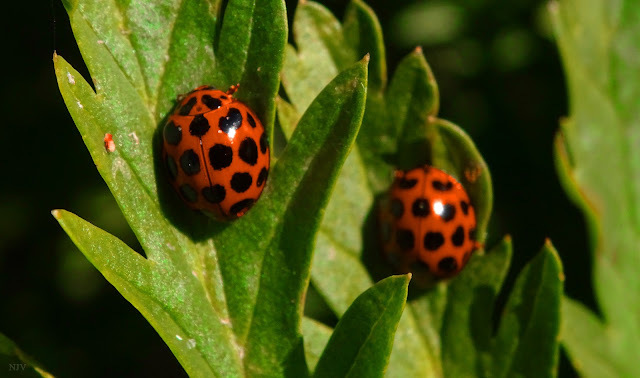 Harmonia conformis (the large spotted ladybug) is a species of ladybug (the family Coccinellidae). It has a light reddish appearance and its colouration includes 20 large black spots, 18 of which are found on the elytra (wing covers). They are quite large for ladybirds, being about 6-7 mm long. It is a predator of other insects, eating aphids as both a larva and imago (adult). It is found in Australia, and has been introduced to New Zealand, where it is common in northern regions. Another member of the same genus, Harmonia antipoda, also occurs in New Zealand. This species, however, is a native and is much smaller and harder to find. This post is part of the My Sunday Best meme.